SPECIAL! $250 discount on all trips until Jan 1! 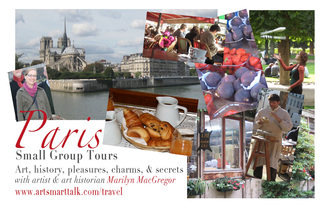 For Paris Arts & Pleasures and Paris & Cathedrals the cost is $2800 per person, including 8 nights in a comfortable, modern clean, bright, elegant, perfectly situated (in the 6th Arr. on the Left Bank) 3 star hotel with an impressive breakfast, all ground transportation in Paris, and all events and activities (private tastings, cooking classes, visits to museums and art studios, concerts, etc., etc.) Other meals are at your discretion, specifically to allow freedom of choice - there is no requirement to eat together as one does with a big tour group. We'll want to try local cafes and restaurants, often together, but people can also, for instance, opt for a 3 star Michelin adventure or wander off for exploring away from the group. I can suggest special restaurants and help with reservations. Lunches will be where we find ourselves for the day - neighborhood spots and small cafes. Airfare is not included - the tour starts and ends at the hotel. Paris & Cathedrals includes the same great hotel and wonderful daily breakfast, museum admissions in Paris, ground transportation in Paris, and travel excursions outside the city for day trips visiting several of the great Gothic Cathedrals (each trip about 1 hour out of Paris) and fascinating side activities in the towns we visit - including a tour of a Champagne House and Cellar and a canal boat ride through ancient, pre-Roman islands and gardens. Activities in Paris are also planned and included, for example a boat ride on the Seine, a concert and a very special breakfast at a famous historic cafe.